As I mentioned earlier in the week, we had a snowstorm and got about 9 inches- causing all sorts of messes. For those of you who’ve never been to Seattle, its VERY hilly and people do not have any idea how to drive in the snow. Unfortunately, the weather experts are predicting an even bigger storm to hit this afternoon. They are calling it Snowmageddon! UGH! Yet, I still have to go to work today (have I mentioned I’m a substitute teacher? ), so I must get dressed in my warmest clothes. I started with jeans, a flannel and my Uggs. Yes, those Uggs are ugly- but boy are they warm! Problem is, the jeans on the left are a straight leg cut- and if you look closely, you can see how they bag and gather at the knees and ankles. The loose fitting flannel, while incredibly warm, is not flattering and a little boxy..
So… to change it up a bit, I switched to a skinny jean. These are made by Good American, and they have a ton of stretch in them which makes them super comfortable. While there is a tiny bit of gathering around the knees, I still think the skinny cut is better. I then added a cream knit sweater over the flannel shirt. This sweater is Vince, which I love, but is very expensive. I bought it at Nordstrom Rack, and it’s one of my favorites. I think it’s cute with the tails of the flannel peeking out. They add a bit of color and variety. I also stacked a few bracelets, just because I’m trying to be more stylish! All in all, this is a super warm outfit for a VERY cold winter’s day. Stay warm and safe friends! I was so comfy and cozy in my leggings yesterday, and since we have another snow day, I’ve decided to wear a different pair today. There’s just something about wearing leggings- it’s sort of like staying in your jammies all day! Heaven! Originally, I was planning on wearing black jeans, a black top and this fun faux shearling vest (as seen on the left). To be honest, I like this outfit, it’s a little plain, but that’s sort of my style! But since it is so snowy and cold outside, I decided that I’d rather wear my camo leggings and this cream sweater, topped off with the vest. As for my shoes- yes, I am wearing my Uggs. I know I’ve been a little mean to them lately, and I still think they are large and clunky looking, but with the camo leggings I don’t mind them as much. Plus, they are nice and warm! Truth be told, what I really wanted to wear are my Sorels– as seen below, but my 15 year old daughter said no. What do you think? Are they still in style? They are the perfect snow boot- warm, furry inside, non slip soles… but they are HUGE! If I were to actually go outside and tromp around in the snow- I would definitely wear them. Instead, I’ll sit inside by the fire and watch Bosch on Amazon Prime video! 🙂 Chime in with what you are watching on Netflix or Prime- I’m always looking for a new show! Don’t forget, I’m posting on Instagram each morning as well. It’s a quick and easy way to see outfit ideas! Just click the link up at the top of the page. This is one of those Saturdays where it’s all about sports! 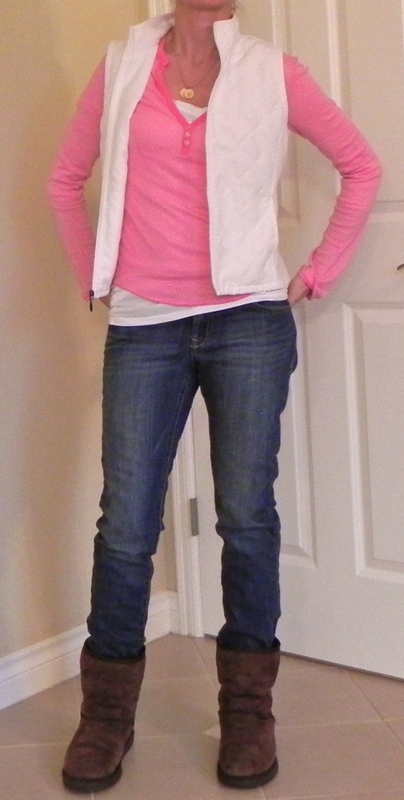 My son has 2 basketball games AND lacrosse practice, so my outfit needs to be warm, comfy and casual. I’ve opted for my ‘boyfriend’ jeans and a striped pink t shirt layered over a white shirt. Then to follow my rule of 3- I’ve added a vest. And, dare I say it- my UGGS! Yikes! I’ll admit they are super ugly- but they are also super comfy, and warm, and good for when I’m going to be on my feet all day. It’s not super stylish, but it’s at least an improvement over the outfit on the right. The only reason I even own a long sleeved collared shirt is because I used to play golf. However, in ‘Everyday Life’, a collared shirt is usually worn by those who wear it as a work uniform. So, unless you have a job that requires you to wear a collared shirt, or you are playing golf- take my advice and try a plain t shirt instead. I know the Uggs are Ugly, but they are warm!